Le Petit Journal was a daily Parisian newspaper published from 1863 to 1944. It was founded by Moïse Polydore Millaud. In the 1890s, at the height of its popularity, the newspaper had a circulation of a million copies, and by 1884 it also included a weekly illustrated supplement. 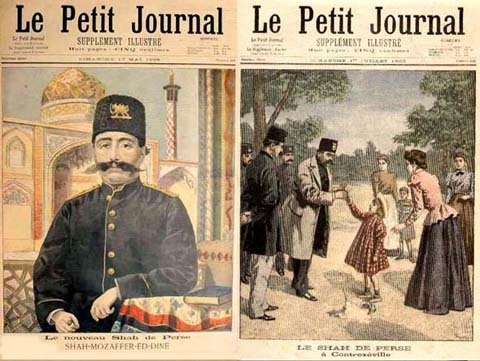 The two top images include a portrait of Mozaffaradin Shah Qajar before his coronation and his visit to Contrexeville France is illustrated in the Petit Journal. The image bellow, shows the much aged monarch. 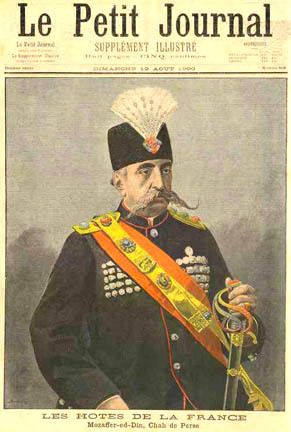 You may also click on link  to look at another post about cartoon drawing of the same Persian monarch in Le Rire magazine.